Hey, everyone. Nesse episódio do podcast Inglês Online eu vou falar sobre três expressões em inglês com animais. Enjoy! Hi! What have you been up to? Today we have a new episode of the inglesonline podcast, and I have three expressions that use animals to express an idea. Basically they take things that we, human beings, do, and compare them to how we think certain animals would do them. First up: sweating like a pig. Yeah, that’s a good one to start with. I’ve never seen a pig sweat, to be honest, but that’s how the expression goes: sweating like a pig. So I looked for a few examples on the web and here’s what came up: one guy said that he arrived at the train station after a ten-minute walk and that he was now sweating like a pig. So just to make sure we’re all on the same page… If you’re sweating like a pig, that means that you’re sweating A LOT. Just imagine a hot summer day wherever you are in Brazil… now imagine you had to walk for fifteen minutes to get to the bus stop and then you had to wait another fifteen minutes for the bus to get there. You hop on the packed bus and it’s like a sauna in there. Got the picture? You know, you might be sweating like a pig by the time you get in the bus. One more thing: notice that if you’re talking about more than one person, you say “They were sweating like pigs” or “We are sweating like pigs”. Here’s another one: a bear hug. Imagine a bear giving you a hug. Yep, that’s pretty much it. There’s probably someone in your family who gives bear hugs. You know, that big, strong hug that completely embraces you? That’s a bear hug. One girl tweeted that she was feeling down and needed a bear hug. Another girl tweeted that her brother just went up to her and gave her a bear hug. So when did you last give or get a bear hug? And now, another way we talk about a person comparing them to an animal: we can say that someone is as quiet as a mouse; or just quiet as a mouse. I’ve even heard, simply, “She’s a mouse”, meaning – that person is very, very quiet, as in, she moves very quietly. When she gets home you don’t even notice. When she leaves the house, she does so very quietly. It’s never a problem if this person gets home late, when everyone else is already in bed sleeping. It’s not a problem because she (or he) is quiet as a mouse and won’t wake anyone up. Have you ever come across people like this? I have. They make the best roommates ever. I have also come across people who are the opposite – very noisy and not really mindful of other people’s sleep. Here’s one tweet that I found that includes this expression: “When my parents are asleep I’m as quiet as a mouse but … when I’m asleep there might as well be a concert downstairs!” So what this person is saying is that when her parents are asleep… She’s really quiet. She doesn’t make a lot of noise. She’s quiet as a mouse. Now, when it’s her turn to sleep… It’s so noisy downstairs that it sounds as though there’s a music concert going on. So here are my questions to you: first, sweating like a pig. It happens to everyone, so tell us when your last time was. Who do you know that gives bear hugs? And lastly, what are your comments about being quiet as a mouse? Is this you, or someone you know? Let us know in the comments and talk to you next time. Got the picture? = Deu pra imaginar? When did you last (do something)? = Qual foi a última vez que você (fez alguma coisa)? This podcast remember my father! He used to give us bear hugs! And he even was not quite as a mouse… He was very noise. To take the busses here in Brazil makes anyone sweat like a pig. But every time I’m skateboarding, in few minutes, I start to sweat like a pig, but in this case I love it. Often when I’m running and the weather is boiling I sweat like pig. Fortunately i’ve been run along to the beach and the wind has helped me. Here at home everybody is the opposite to “quiet as a mouse”. Great site mainly the podcasts. I aways sweat like a pig after get the full bus. 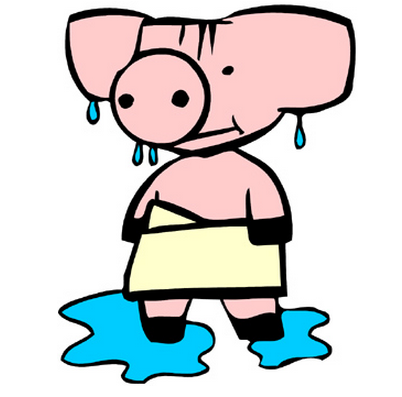 In Vitoria / ES, right now, i’m sweating like pig. We’re on winter, but the temperature is like summer. Hi Ana! Nice post! I can easily sweat like a pig and I’m certainly not as quite as a mouse person. On the contrary, I make a lot of noise all the time with my little girl at home. Ana great podcast! Well,yesterday I needed to go to the city and in order to get there I had to take a bus but I left home a little late so I had to run to get to the bus stop,when I arrived there I was sweating like a pig!I just HATE when that happens!!! !lol but hopefully I didn’t miss the bus!!! Ana eu tenho uma sugestao,seria legal se vc escrevesse uma dica de pronuncia com audio sobre glottal stop,isso ajudaria a aumentar a compreensao no ingles falado pois isso confunde um pouco!thanks a lot for all,see you next time! Hi.once i came across to this person who got a bear hug from her nephew and ended up with a broke ribs.yeah sometimes we have to control our emotions..hehhe people usally sweat like a pig during the jogging or even during their working out.,but i can tell you,during this time in florida its hard to walk without sweating like a pig. how about ” it is raining dogs and cats? Yeah,i think i first heard it on Randalls page , you know the esllab?theres a podcast called “clothing style”that mentioned it. Previous Post Jogo dos 7 erros em inglês: Born to be wild Next Post Minhas surpresas com o inglês aqui do Reino Unido!